Below is a very thoughtful heads-up message sent to us by a subscriber to ReturnToExcellence.net re an unpleasant experience she had @ a recent Town Hall meeting. It is very similar to one I had @ a Tea Party meeting last fall where the hostess, in her introductory remarks, warned people in the audience to be aware of "plants" @ upcoming Tea Party meetings. Little did we know that I was going to experience one during my FairTax presentation just a few minutes later - the "plant" tried to disrupt my presentation & could only complain about everything until he was virtually booed out of the meeting hall. In the case of the Town Hall meeting described below we have good reason to believe that MoveON.org or some similar group had the same idea to disrupt or control the meeting to discourage people from coming again to participate in one of the freedoms our Founders fought for. I highlight in red below a sentence that is right out of the Alinsky method that BO epitomizes. Thanks for such a great write-up that can only encourage us all to fight back against these insidious enemies of America. I attended the Lance Town Hall meeting on Monday, May 16 from 5:00 p.m. – 7:00 p.m. I found out about the meeting because I signed up for the Branchburg email newsletter. There wasn't a phone call or email notification from Congressman Lance's office as had been the case with other Town Hall meetings. The time was not very convenient for people who work and that may account for the low turnout. My estimate is about 50 people. As I was walking to the municipal building I noticed a group of about eight to ten people standing in a group having a discussion. Since I didn't recognize any of them I went inside and sat down. I recognized a handful of Branchburg residents inside and I was joined by a friend from the Somerset County Tea Party who I was not expecting to see. He informed me that MoveON.org was supposed to be attending the Town Hall. I was expecting to see a group of young people with signs, but didn't. The group that had been having a discussion in the parking lot was present, but they did not sit together with the exception of a husband and wife team. They looked pretty middle-aged so I did not suspect them of being MoveON.org. Congressman Lance spoke for a while and then opened up the question and answer period. 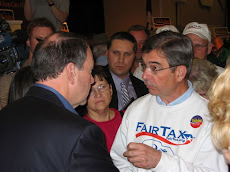 The very first person he called on was a woman who went on for what seemed to be 10 minutes or more on why Congress should raise taxes to take care of people and programs who need funding. She seemed to be more interested in making a speech than asking a question. One woman tried to interrupt because the first woman was talking so long, and Congressman Lance shushed her and allowed the first woman to continue. 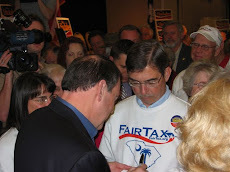 Pretty much all of the questions were addressing the same "tax and spend" theme with the exception of one that my friend from the Tea Party was able to get in. Congressman Lance held his own and in a very calm manner disagreed with pretty much everything they said. Both the husband and wife who, I believe, came from the parking lot group were allowed to ask questions. What was interesting to me was that these questions were not at all what I would expect from a solidly Republican area. It is my feeling that members of MoveON.org were attending and controlling the meeting. It was easy for them because they did not look like young radicals, and they blended into the audience well. Since Congressman Lance did not allow anyone to interrupt them, it was easy for them to dominate the meeting. Also, there was a policeman present and I think that might have kept some people from calling out. I am not blaming Congressman Lance for this one sided meeting, but am suggesting that when attending a Town Hall meeting in the future it would be good to bring a group of like-minded friends along and scatter them throughout the audience so that there is a better chance of being called on. This entire scene you described is appalling - can't even have an honest and fair town hall meeting anymore. Very difficult to make yourself heard unless you are one of the "establishment". You might be interested to know that there was a letter to the editor in the Hunterdon Democrat last week that complained about the same thing at a Lance town hall meeting somewhere in Hunterdon. Someone asked the writer, Lee Anderson, if she was from MoveON.org and when she replied "Not a chance" an elderly woman said, "I hope you'll be civil." MoveON.org is definitely using older people to monopolize town hall meetings. Lee Anderson went on to say "Their clear message of "shared sacrifice" meant that our money was necessary to further their agenda of "progressive" social programs for those most "in need." Thanks for getting the word out about this, Doug.